When it comes to inclusivity for Alabama’s LGBTQ (lesbian, gay, bisexual, transgender, queer) community, a new study released by Human Rights Campaign (HRC) Foundation — the educational arm of the nation’s largest lesbian, gay, bisexual, transgender and queer (LGBTQ) civil rights organization — found most cities aren’t particularly LGBTQ-friendly. 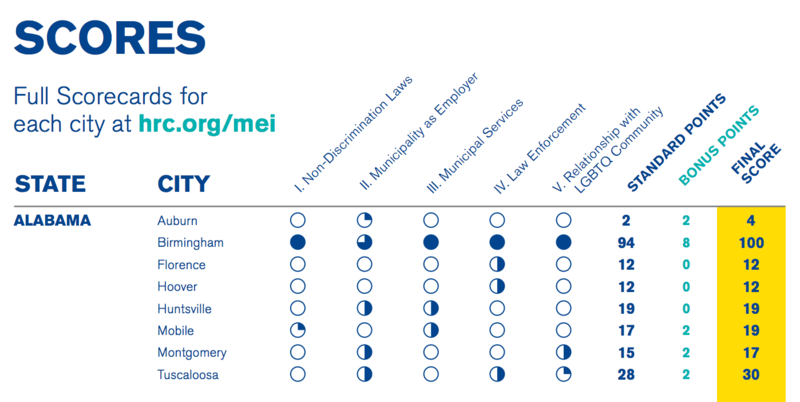 The scores of the seventh annual Municipal Equality Index (MEI), which were released Monday, looked at 506 municipalities in all 50 states to determine how inclusive municipal laws, policies, and services are of LGBTQ people who live and work there. Cities are rated based on non-discrimination laws, the municipality as an employer, municipal services, law enforcement and the city leadership’s public position on equality. As part of the study, eight Alabama cities were scored on their commitment to the health, welfare, safety and equality of the LGBTQ community. Only Birmingham, managed to surpass the national average of 58, as the Magic City received a perfect 100 points making it “the first city in the Deep South to reach this zenith.” Meanwhile, the next highest Alabama city wasTuscaloosa with only 30 points. Both Huntsville and Mobile trailed with 19 points, with Montgomery close behind with 17. Florence and Hoover tied with 12 points, and Auburn comes in last with just 4 points. It turns out, Alabama is currently one of 30 states without comprehensive LGBTQ-inclusive non-discrimination protections at the state level.